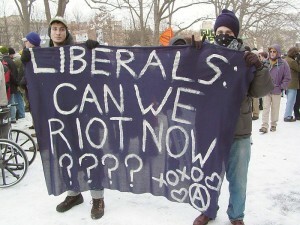 Would someone please explain something to me: When did liberals get so utterly intolerant? To me, tolerance of opposing views, almost a kind of patient sympathy for those unenlightened individuals who just don’t get it yet, always had been a hallmark of liberalism: Live and let live. But in the Obama era, it’s Live and Let Die (cue Paul McCartney & Wings). Liberals seem every bit as intolerant of dissent and difference as arch-conservatives always have been. DeBlasio is the most liberal New York mayor in 20 years. He racked up 73% of the vote by lamenting the wealth gap and vowing to raise taxes on the top 2% of earners to fund a pre-kindergarten program. It didn’t bother anyone that only the state, not the city, wields that power. When Gov. Cuomo proposed setting up the pre-K program without having to raises taxes, the Robin-Hooded mayor still wanted the tax hike anyway. Gay marriage is an issue steeped in tolerance, yet today some proponents are intolerant of anyone who opposes it. To be against gay marriage now is depicted as being racist against gays, to be a hater. Never mind religious reasons or whether some folks are just behind the times. In Chicago, Obama alum Mayor Rahm Emanuel said in 2012 that Chick-fil-A isn’t welcome in his town, after the chain’s CEO said he supports traditional marriage and gave money to Christian outfits. Liberals are targeting companies that dare contribute money to charities or groups with even a tenuous link to the opposition side of this issue. Unions push measures to force companies to disclose their political spending so as to demonize them for any stances the unions dislike. Elsewhere, if you dare doubt the crisis-stoking claims of the climate-change crusaders, you are labeled an ignorant “denier,” the term used for anti-Semites who deny the Nazi holocaust ever took place. President Obama jeeringly likens CC doubters to members of the Flat Earth Society. Merely questioning climate-change claims has become politically incorrect, an embarrassment. The Los Angeles Times bans reader letters that express any CC doubts. A greenie professor at Rochester Institute of Technology says “deniers” should be charged with criminal negligence. Secretary of State John Kerry has sniped at “a tiny minority of shoddy scientists and extreme ideologues” who would dare question the climate-change threat. In his first policy guidance to the State Department on March 7, he chose to address not terrorism or peace in the Middle East or Russia expansionism. He focused on climate change: “Climate change has special significance for the work we do here at State, and so do clean water, clean air, sustainability, and energy. … We need to elevate the environment in everything we do… (T)hat’s our call to conscience as citizens of this fragile planet we inhabit. So let’s get to work.” Oh, yuck. This liberal intolerance filters down to the hoi polloi. This text comes to me from a Canadian femme-friend: “You are not a climate-change denier??? Sorry, but that does sound foolish, fool.” She’s on a roll: “You are ridiculous, sir, given that over 95% of scientific community agrees—stop embarrassing yourself.… you know it’s true. Admit defeat, like you’re playing Scrabble…” Funny stuff. This intolerance and the vituperative attacks that accompany it usually come from weakness, not strength—it’s a sign of fear that an argument is being lost. Exclusionary, judgmental, polarizing: And here I’d thought the Republicans had a lock on all that. For Democrats and other liberals, nowadays derision is the coin of the realm.